One of the perks of blogging is getting freebies from wonderfully generous companies. 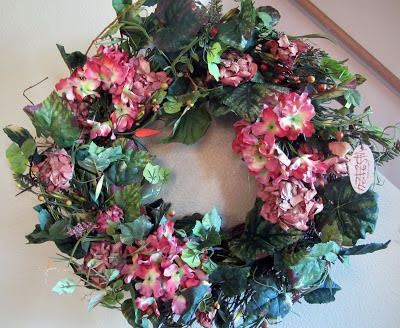 I was ecstatic when The Wreath Depot agreed to coordinate a product review on my blog. Who wouldn't be? 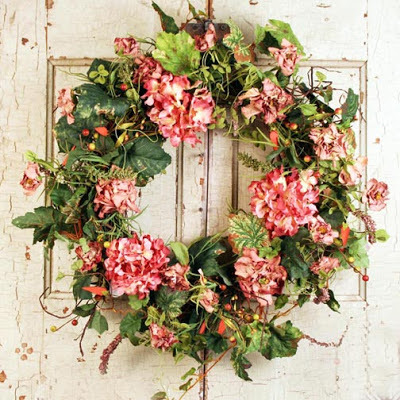 They sell gorgeous, high-quality door wreaths that will bring style and charm to the front of your home. I browsed through their huge selection of colorful floral wreaths and I fell in love instantly with this 24-inch Genesee Silk Wreath. 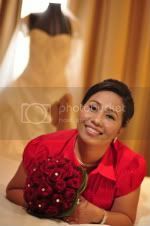 It has a combination of Frosted Greens, Burgundy Berries and fiery bi-color Geraniums and Hydrangea heads. This wreath gives any home the feeling of an English garden in summer. Since this is very versatile looking, you can actually hang it all year round. When I opened the package, I was amazed with the quality of the craftmanship. After all, they are expertly handcrafted here in the USA. It is indeed very well-made and is visually appealing. The color can brighten any home. The foliage leaves and flowers all compliment each other. I already have a perfect spot for it but we still need to do a trip to the store to get some hanging hardware for this beauty. This wreath is huge so I know it can easily draw anyone's attention to the front door. This is really a perfect indoor or outdoor decor if you want to set a warm ambiance to your lovely home. Quite a bit pricey but the quality of this product is well worth the price. The Wreath Depot is actually having a Spring Celebration Sale right now. So if you're interested, check out their website and enjoy a 10% discount off of any wreath order, plus you get Free Shipping. Isn't it an awesome deal? Disclosure: Product mentioned above was provided for FREE by The Wreath Depot for product endorsement/review purposes. I am disclosing this post in accordance with the FTC guidelines concerning the Use of Endorsements and Testimonials in Advertising. That is a beautiful wreath! I am glad it is made in the USA--at this point I am attempting to only buy USA made products! We bought our house almost a year ago and sadly I still haven't gotten or made a wreath for the door. Wow that is absolutely stunning! What a great way to brighten up your home for spring. That would make a beautiful addition to a rustic country home :) like mine!! Love this! Those are beautiful. I would love one for next to my front door. What a way to welcome guests. These are so pretty! I love to have one on our front door. Indeed, a beautiful wreath! Thank's for the review. Anything made in the USA is great and quality made. This is a beautiful wreath, i like it. Gorgeous wreath, I only have Christmas wreath. I like to put a nice wreath on our front door, it makes the house look more alive and liveable. I might check the website later. Thank you for sharing.